Have you been looking for information about entry doors with sidelites Houston? If you are not having much luck, you might want to double-check your search terms. Using correct spelling can often help you find more reliable results. Misspellings may be part of company names, which can change the type of results you will receive. When you are looking for information about your front door, you want to be sure it is accurate. Many homeowners have questions about front sidelight replacements. It can be hard to know when you should replace your door. It is possible to repair some types of damage to doors. In other situations, it is better to replace the entire door. It depends on the type of door and the type of damage. There are a few general guidelines you can keep in mind that will help you decide what is best for your home. Consumers who decide to replace their doors can visit Southern Front. Southern Front has a vast selection of doors including wood and fiberglass entry doors with one sidelight. You can visit Southern Front online at http://www.southernfront.com to see their catalogue. If you do not find the right door for your home, ask about custom models. You can also reach Southern Front by calling 281-890-5860. They are happy to give you information about their products. Southern Front also sells individual parts, making them perfect for your repair needs. Many homes have wood entry doors with one sidelight. These doorways are welcoming and inviting. They allow sunlight to spill into your home while still offering increased privacy. This style of door also looks amazing. To keep your door looking like new, be sure you examine in on a regular basis for small signs of damage. It is easy to repair small things like scratches and dents you spot them early on. Wood that is rotting or warping may be beyond repair. In situations like this, it is often cheaper to replace the door rather than invest in short-term solutions. Likewise, if you no longer like the door, think about replacing it. Your entry door sets the tone for your home. You do not want to walk in your home feeling unhappy with your decor every day. If you are thinking about replacing your wooden door, visit Southern Front. They have a large selection of wooden doors available. You can also find doors in other materials and finishes if you are looking for a big change. Visit them online at http://www.southernfront.com to view their entire product catalogue. Custom models are also available if you do not find the door of your dreams. Prospective customers can contact Southern Front by calling 281-890-5860. Fiberglas entry doors with sidelights are another popular choice for modern homeowners. This style of door looks beautiful and is very durable. Fiberglass is available in many different finishes, with some even looking like real wood. Other benefits include increased insulation and better sound isolation. Fiberglass is a thick material and will last a long time. Its durability is one of the main reasons it is perfect for exterior doors. Despite its durability, fiberglass can receive damage. Things like minor scratches and cracks often appear over time. It is easy to fix these small imperfections if you notice them early on. Many companies will offer a warranty on their fiberglass doors. If this is the case, check and see if it covers scratches and dents. You should think about replacing your door if there are large cracks or if chunks of glass are missing. Consider replacing your door if you no longer love the look too. Remember that your personal preferences are important. Southern Front is the perfect place to go for fiberglass doors. They offer a warranty on these doors, giving you peace of mind. Southern Front also has a large selection available. If you do not find a door you love, you can discuss custom solutions with sales staff. Visit Southern Front online at http://www.southernfront.com to learn more. If you prefer to speak with a staff member, call 281-890-5860 today. In some cases it is obvious you need front sidelight replacement. Large cracks in the glass or a warped frame are not easy to repair. Some companies are able to replace the pane of glass, allowing you to keep your frame. Likewise, it is possible to replace warped frame while still keeping the same pane of glass. Do not undertake these home projects yourself. Instead, contact a door and glass retailer. Even if you feel confident doing the legwork yourself, be sure you have professional advice behind you. If you do need to replace your sidelight, take a few moments and examine your front door, too. Rotting wood can spread fast, so you will want to examine the doorframe as well as the door itself. When damage happens to one side, it may also happen to the other. It may be cheaper to replace your front door and sidelight at once now, rather than replacing your sidelight now and your door later. Customers thinking about replacing their sidelight or entry door should visit Southern Front. Southern Front has a ton of doors available in many different styles and materials. You can view their catalogue online by visiting http://www.southernfront.com. Prospective customers can contact them by calling 281-890-5860. Southern Front is happy to discuss custom options. They are also proud to offer shipping across the U.S. and Canada. 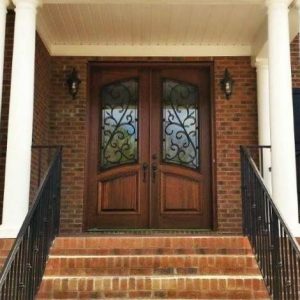 Many homeowners may wonder when they need to worry about entry door and front sidelight replacements. While some damage is easy to fix, other types of damage mean you need to replace your door as soon as possible. Learning the difference between the two can save you a lot of money and hassle. Southern Front offers both replacement doors and individual parts. Visit them online at http://www.southernfront.com to see their product catalogue. Prospective customers can contact them by calling 281-890-5860. They are happy to give you accurate information about your entry doors with sidelites Houston.